Raspberry Pi as a HD looping video player in museums, libaries and galleries. Jun 2012 - Placed order for first of many Raspberry Pi's. Sep 2012 - Attended Software Freedom Day Melbourne to identify the technical skillset required to make the Pi immutable, read-only and immune to power cycling. Feb 2013 - Began extensive and ongoing participation on github in testing various omxplayer video looping techniques. Feb 2013 - Met with Alex Bradbury of the Raspberry Pi Foundation to discuss my belief in the potential of the Pi's as a looping video player in museums. Jan 2014 - Delivered Lightning Talk [Play Video] at Linux Conference Australia in Perth to promote concept and appeal for assistance with read-only file system. Jul 2014 - Victor Hugo: Les MisŽrables - From Page to Stage Exhibition opens at State Library Melbourne using 3 Raspberry Pi's as video players replacing proprietory solutions and looping video for 14 weeks without failure. 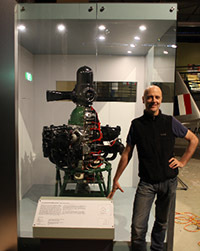 Oct 2014 - RAAF Museum Point Cook. First Raspberry Pi installation in a permanent exhibition is completed. Oct 2015 - Attendees at the upcoming National Digital Forum pre-conference workshop in New Zealand will learn how to create a multilingual Raspberry Pi video player that supports English and Te Reo Maori closed captions/subtitles with on-the-fly switching between the two languages via touch switches embedded in a graphic panel. Demo video of single language version. A through-graphic-panel touch switch replaces a vacuum timer switch creating a neater look that is easier to keep clean. A custom controller board, programmed using the Arduino IDE, prevents over-heating and wear of the sectioned radial engine and logs visitor activation of the exhibit to an SD card as a csv file enabling curatorial analysis. Using consumer DVD players can be problematic in museum exhibits because few, if any, domestic DVD players are able to startup automatically when power is applied to the gallery. The ability to power-up and commence disc playback from a cold-start is one of the features that differentiates Industrial DVD Players from cheaper consumer models. However the significant price differential often means that consumer players are pressed into service and must be manually turned on each morning by staff. The Temporary Exhibition Controller, originally developed for the Nick Cave exhibition produced by Two Feathers for the Victorian Arts Centre in Melbourne, can learn the power on and play commands for a consumer player and automatically send them when gallery power is applied. If the DVD has been authored to auto-start playback becomes fully automated. Alternatively if the disc has a menu then following the power on command, the play command can be sent to play the default title after a suitable delay to allow the menu to build. Power on commands can also be sent to display devices such as video monitors or projectors. The controller saves staff time during the morning walkaround and allows more flexbility when designing or retro-fitting AV equipment within an exhibition. Please email for further details and pricing. A collaboration between the Victorian Arts Centre and the Museum of Western of Australia. The exhibition included a requirement to sychronise rock-and-roll lighting PAR cans with concert vision of the band playing off Blu-Ray. 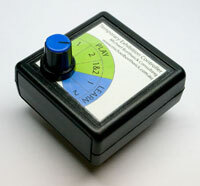 A novel controller was developed that responded to control signals recorded on the surround channels of the re-authored Blu-Ray disc, controlling the lighting dimmers via the DMX protocol. The project used a number of custom PCB's including an AVR controller programmed using the Arduino IDE. Refugee Realities simulated, for school-age children, aspects of the experiences of the life of a refugee. Michael provided technical support to the sound-designer in order to realise an emotionally intense multi-channel soundscape and an audio simulation of the experience of crossing a mine -infested desert at night. Over a mere 96 hours 3 custom controllers were fabricated from scratch that interfaced triggers buried under two tonnes of sand to a drum synthesizer triggered via the MIDI protocol. The simulation received global media coverage and the "desert room" was regarded as one of the most successful elements of the project. The project used a custom AVR controller programmed using the Arduino IDE and would not have been possible in the truncated time frame without utilising various libraries and other resources made available by the Arduino community.